202234-BThe ZPure Glass H2O Filter is for applications requiring high-efficiency moisture removal with the benefit of a depletion indicator. 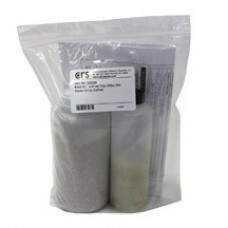 The adsorbing materials are molecular Sieve 5A and cobalt-free CoFree™ indicator. The CoFree indicator changes color from greenish-yellow to blue at 4-6% relative humidity to signal leaks in the system; the molecular sieve removes moisture to trace levels. The gas to be purified contacts only glass, metal and the adsorbents. Dual Seal Design: In this design the heavy-walled inner glass tube is protected by a sealed outer plastic tube. This design provides extra protection if the glass tube were to fail, the gas system is still fully protected against leaks. An internal frit at each end prevents particulate contamination.LIÊN HỆ:Email: info.esteco@gmail.comĐiện thoại: +84 979 987 250..
202232D-BThe ZPure HC will remove hydrocarbons heavier than butane from inert gases, He, Ar, N2, H2, and clean dry air (CDA) to low ppb levels. It is also recommended for most applications that require hydrocarbon-free gas, and is available in 4 sizes of stainless steel cylinders ranging from 130 cc to 750 cc. The ZPure HC Filter is available with standard compression fittings and quick connect fittings offered in ¼” and 1/8” brass and stainless steel, or metal push-to-connect fittings in ¼” and 6 mm for plastic tubing and non-carrier gas lines. LIÊN HỆ:Email: info.esteco@gmail.comĐiện thoại: +84 979 987 250..
202903A high-capacity gas purifying system designed to reduce contaminants in gases commonly used in laboratory applications to low-ppb levels, available in two models. The AFS Purifier II removes water and hydrocarbons (>C4) from air, hydrogen, nitrogen, helium, and other inert gases. It contains a high sensitivity moisture indicator that changes from BLUE to BROWN when the capacity is depleted. Both AFS Purifier I and AFS Purifier II have a very high capacity and can be expected to supply four GC's for at least one year when used with 99.995% pure gas supplies (provided reasonable care is taken during tank changes). 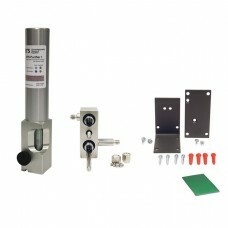 The Advanced Filter System Complete Kit includes the AFS Cartridge, Manifold, and the wall and bench mounting brackets. LÊN HỆ:Email: info.esteco@gmail.comĐiện thoại: +84 979 987 250..
202900A high-capacity gas purifying system designed to reduce contaminants in gases commonly used in laboratory applications to low-ppb levels, available in two models. 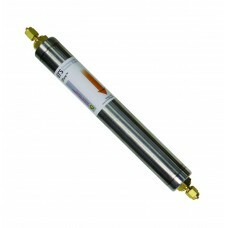 The AFS Purifier I removes oxygen, moisture and hydrocarbons, (greater than C4) from inert gases and hydrogen. It contains high-sensitivity oxygen and moisture indicator. When cartridge is depleted the oxygen indicator changes from GREEN to GREY. The Moisture indicator changes from BLUE to BROWN. Both AFS Purifier I and AFS Purifier II have a very high capacity and can be expected to supply four GC's for at least one year when used with 99.995% pure gas supplies (provided reasonable care is taken during tank changes). 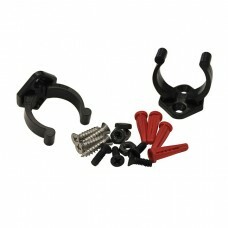 The Advanced Filter System Complete Kit includes the AFS Cartridge, Manifold, and the wall and bench mounting brackets. LIÊN HỆ:Email: info.esteco@gmail.comĐiện thoại: +84 979 987 250..
202285D-BThe ZPure PolyGas I Purifier is a triple filter that removes a wide range of contaminants including O2, H2O, CO2, CO, halogenated compounds, siloxanes, hydrocarbons heavier than butane, sulfur-containing molecules, ammonia and other gases. 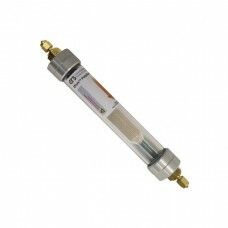 It can be used to purify inert gases, He, Ar, N2, and H2, making it ideal for use with GC and GC/MS carrier gas lines. It is also recommended for any application requiring ultra-pure gas free from oxygen, water and hydrocarbons (heavier than butane). LIÊN HỆ:Email: info.esteco@gmail.comĐiện thoại: +84 979987250..
202216-BThe ZPure O2 Filter removes O2 from He, Ar, N2, H2, and methane to low ppb levels, with very high capacity in a compact package.The ZPure O2 Filter is available with standard compression fittings or quick connect fittings in 1/4" and 1/8" brass and stainless steel. *This item requires hazardous shipping. LIÊN HỆ:Email: info.esteco@gmail.comĐiện thoại: +84 979 987 250..
202352Remove carbon dioxide from your gas stream with our high capacity carbon dioxide trap. Its unique design uses NaOH blended with molecular sieve to scrub out CO2. The reaction produces water which is adsorbed by the molecular sieve. Not recommended for GC use. When downstream water is a concern we recommend using a second moisture purifier in line as a safety measure. LIÊN HỆ:Email: info.esteco@gmail.comĐiện thoại: +84 979 987 250..
202200High capacity oxygen purifier for long term protection of capillary column stationary phases against oxidation at GC operating temperatures. It is also recommended for packed column carrier gases and is effective for removing sulfur compounds, such as hydrogen sulfide and mercaptans. The Model 1000 is intended for use with non-oxidizing gases such as He, Ar, N2, H2 or CH4, containing less than 1% oxygen. 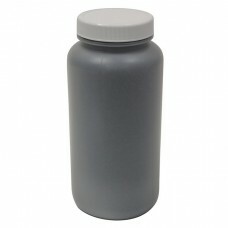 The Model 1000 Oxygen Purifier is a high-pressure metal cylinder filled with 500 cc of active oxygen adsorbent. The adsorbent binds covalently with oxygen; no gas is generated from this reaction. 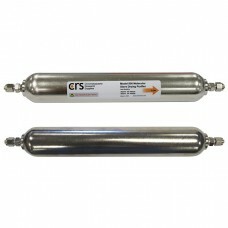 It is delivered in the active state, filled with high-purity helium. It is ready for use, but we recommend that the purifier be purged with the gas you will be using. Regeneration: The Model 1000 may be regenerated. Factory regeneration service is recommended, see item number 202204. *Note that sulfur compounds permanently poison the adsorbent.LIÊN HỆ:Email: info.esteco@gmail.comĐiện thoại: +84 979 987 250..
202332This a high-pressure metal cylinder filled with 500 cc of activated charcoal, one of the most effective adsorbents for organics and hydrocarbons. 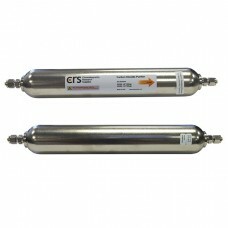 Removes C5 weight and heavier hydrocarbons from inert gases, air, or hydrogen to low ppb levels. 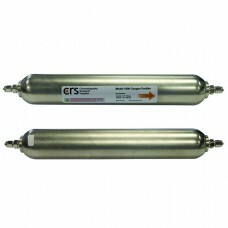 It is also recommended for use with purge and trap apparatuses, and with GC carrier gases for trace analyses. Highest efficiency is obtained using flow rates below 500 cc/min. Frits in each end prevent fines from entering the gas stream. 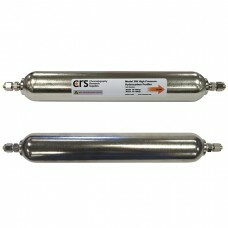 The Model 300 is delivered filled with high-purity helium; it should be purged before use with the gas you will be using. LIÊN HỆ:Email: info.esteco@gmail.comĐiện thoại: +84 979 987 250..
202272The Model 500 Purifier is part of the CRS Legacy Line. 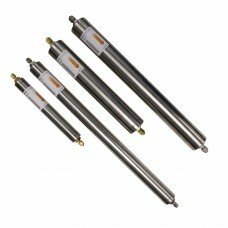 They are sturdy stainless steel cylinders that are recognized for their high pressure ratings, large capacities, and exceptional efficiency. The Model 500 removes moisture from the gas stream. It is shipped filled with high-purity helium, and regeneration service is available LIÊN HỆ:Email: info.esteco@gmail.comĐiện thoại: +84 979 987 250..
202298This contains one jar each of CoFree(TM) Indicator and Molecular Sieve 5A.LIÊN HỆ:Email: info.esteco@gmail.comĐiện thoại: +84 979 987 250..
202243Packaged: 6 in. x 2-3/4 in. Plastic Bottle in a 6 in. x 9 in. Plastic Bag.Weight: 320.3 g LIÊN HỆ:Email: info.esteco@gmail.comĐiện thoại: +84 979 987 250..
202290The SPure H2O is a moisture, oil, and dust purifier suitable for drying laboratory air or central air supplies. It has a high-strength polycarbonate body (acrylic in the 400 cc version) with aluminum endcaps and standard brass and stainless steel compression fittings (nickel plated brass in the 400 cc version). The purifier is filled with molecular sieve and CoFree™ moisture indicator. The CoFree changes from greenish-yellow to blue at low relative humidity to warn of leaks in the gas stream. 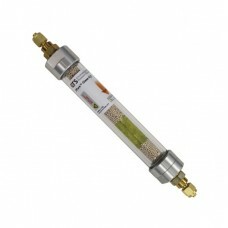 For applications requiring very high levels of purity we recommend using one of the chromatography-grade gas purifiers, such as the ZPure Glass Indicating H2O Filter or the stainless steel ZPure H2O Filter if no visual indicator is required.LIÊN HỆ:Email: info.esteco@gmail.comĐiện thoại: +84 979 987 250..
205705Standard Mounting Kit for Filters / Traps / Purifiers (With Hardware) . To be used with 130 cc and 475 cc Stainless steel ZPure Filters.This kit can also be used with all ZPure glass indicating purifiers and 88 cc or 116 cc SPure Filters.LIÊN HỆ:Email: info.esteco@gmail.comĐiện thoại: +84 979 987 250..
202212D-BThe ZPure CO2 Filter removes carbon dioxide from inert gases, He, Ar, N2, H2, and clean dry air (CDA) to low ppb levels. The filter functions by consuming carbon dioxide in a reaction with highly-dispersed NaOH on a silicate support. The reaction produces water which remains adsorbed in the purifier. In highly critical applications consideration should be given to using an additional moisture trap after the CO2 Filter as a safety measure. It is available in 4 sizes of stainless steel cylinders ranging from 130 cc to 750 cc. 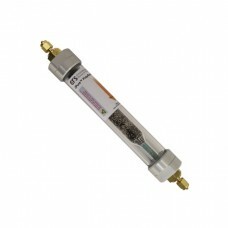 The ZPure CO2 Filter is available with standard compression fittings and quick connect fittings offered in ¼” and 1/8” brass and stainless steel, or metal push-to-connect fittings in ¼” and 6 mm for plastic tubing. LIÊN HỆ:Email: info.esteco@gmail.comĐiện thoại: +84 979 987 250..
202206-BProtect the stationary phase of your column from oxygen and water degradation with the ZPure Dual Filter. It is a compact purifier designed for GC/MS carrier gas lines to improve baseline and sensitivity. *This item ships as a hazardous small quantity exception LIÊN HỆ:Email: info.esteco@gmail.comĐiện thoại: +84 979 987 250..
202283-BThe ZPure H2O HSMI Filter removes water to low ppb levels from gas streams. The high-sensitivity visual indicator signals depletion when exposed to moisture at levels of 1ppm or more. 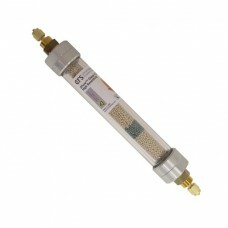 This is an advanced-design gas purifier for applications requiring high-efficiency moisture removal with a highly sensitive moisture indicator. 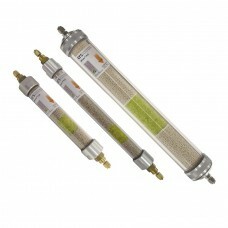 The adsorbing materials are Molecular Sieve 5A and a HSMI™ indicator, held in a sturdy glass tube. The gas to be purified contacts only glass, metal and the adsorbents.Dual Seal Design: In this design the heavy-walled inner glass tube is protected by a sealed outer plastic tube. This design provides extra protection if the glass tube were to fail, the gas system is still fully protected against leaks. 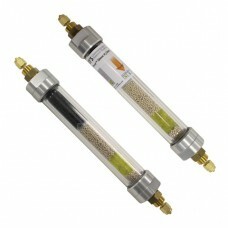 An internal frit at each end prevents particulate contamination.The ZPure Glass Filters and Purifiers are available with standard compression fittings or quick connect fittings in 1/4” and 1/8” brass and stainless steel. LIÊN HỆ:Email: info.esteco@gmail.comĐiện thoại: +84 979 987 250..
202256Removes water and C5 weight and heavier hydrocarbons from air or inert gases. The inner glass tube contains activated carbon, Co-Free™ moisture indicator and molecular sieve. The CoFree changes from greenish-yellow to blue at low relative humidity to warn of leaks in the gas stream. Gas lines are protected from dust by 10um frits at both ends of the filter. Dual Seal Design: In this design the heavy-walled inner glass tube is protected by a sealed outer plastic tube. This design provides extra protection if the glass tube were to fail, the gas system is still fully protected against leaks. An internal frit at each end prevents particulate contamination. The ZPure Glass Filters and Purifiers are available with standard compression fittings or quick connect fittings in 1/4” and 1/8” brass and stainless steel. LIÊN HỆ:Email: info.esteco@gmail.comĐiện thoại: +84 979 987 250..
202314-BThe most common requirement in gas purification is to remove a wide spectrum of impurities from the supply gas, and the ZPure PolyGas Purifiers are designed with this in mind.The ZPure Glass PolyGas I Purifier removes O2, H2O, CO2, CO, halogenated compounds, siloxanes, hydrocarbons heavier than butane, sulfur-containing molecules, and ammonia form inert gases, He, Ar, N2 and H2. It can be used to provide end-point detection for use with other ZPure Filters. It contains highly sensitive visual indicators for oxygen and water contamination. The indicators signal oxygen breakthrough when the adsorbent changes from green to grey and the moisture indicator changes from blue to brown.The ZPure Glass Filters and Purifiers are available with standard compression fittings or quick connect fittings in 1/4” and 1/8” brass and stainless steel.LIÊN HỆ:Email: info.esteco@gmail.comĐiện thoại: +84 979 987 250..
202318The most common requirement in gas purification is to remove a wide spectrum of impurities from the supply gas, and the ZPure PolyGas Purifiers are designed with this in mind. The ZPure PolyGas II Purifier removes H2O, CO2, halogenated compounds, siloxanes, hydrocarbons heavier than butane, sulfur-containing molecules, and ammonia from inert gases, He, Ar, N2 and H2. It can be used to provide end-point detection for use with other ZPure Filters. This version of the PolyGas II Purifier has a glass body with a polycarbonate shell that isolates the gas stream. It contains a highly sensitive visual indicator for water contamination. The moisture indicator signals breakthrough when it changes from blue to brown.The ZPure Glass Filters and Purifiers are available with standard compression fittings or quick connect fittings in 1/4” and 1/8” brass and stainless steel.LIÊN HỆ:Email: info.esteco@gmail.comĐiện thoại: +84 979 987 250..
202230-BThe ZPure H2O Filter removes moisture from inert gases, He, Ar, N2, H2, methane and clean dry air (CDA) to low ppb levels, with very high capacity. It is recommended for any application that requires ultra-dry gas, and is available in 4 sizes of stainless steel cylinders ranging from 130 cc to 750 cc. The ZPure H2O Filter is available with standard compression fittings or quick connect fittings offered in ¼” and 1/8” brass and stainless steel, or metal push-to-connect fittings in ¼” and 6 mm for plastic tubing and non-carrier gas lines.LIÊN HỆ:Email: info.esteco@gmail.comĐiện thoại: +84 979 987 250..